I have up to date training and a recent enhanced DBS check. Insured for peace of mind. NVQ 3 in Health and social care. Over 15 years experience within this role. I have worked in home care, residential and nursing homes. I have my own transport and full clean driving licence. Non-smoker. Polite, honest and reliable. Will try to accommodate your needs and offer a personalised service. Hours and price to be discussed when you arrange a visit at your house. I have excellent references and up to date DBS checks. I'm NVQ 3 qualified in health and social care. 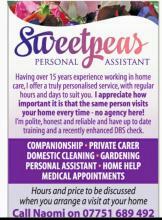 If you just require me to help with cleaning or being taken to medical appointments that can be arranged also. 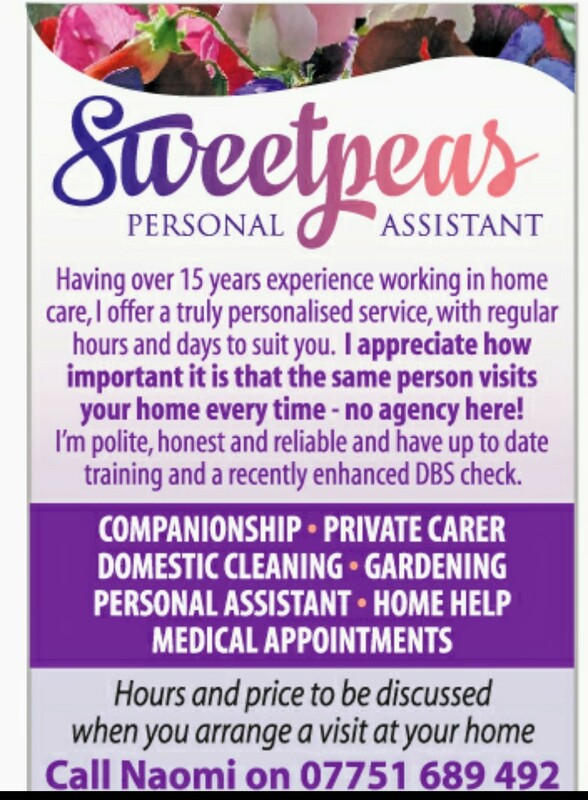 I have a Facebook page under @Sweetpeasdomestic for more information on my services and reviews. My services are always for a hour and then half hour after that. It's for people that can manage on their own but who need that extra help with little jobs or personal care. I cover the Carlisle area. My car is insured for clients to come out with me. I also have public liability insurance for peace of mind.